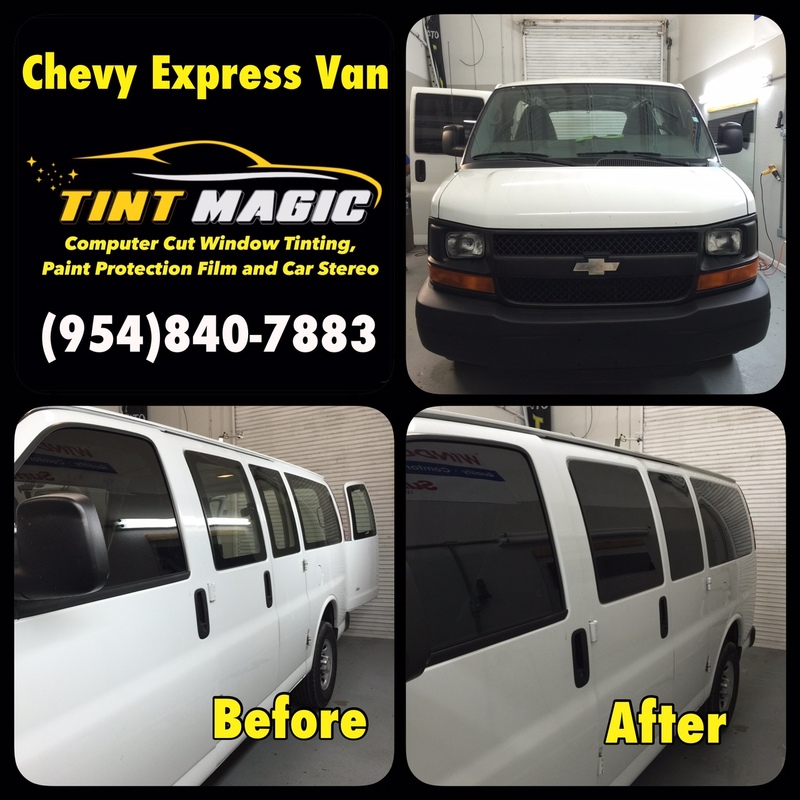 Chevy Express Van at Tint Magic Window Tinting Coral Springs, call us for the best quality and service! (954)840-7883. We are located at 11344 Wiles Road Coral Springs, Fl 33076. Those who are unimpressed by the wave of Euro-style vans can take solace in Chevrolet’s all-American Express. You have your choice of wheelbases, payload capacities, and a towing capacity of up to 10,000 pounds. You can choose a cargo van or a passenger van with room for 12 or 15. Powertrain options include a gas 4.8-liter V-8, one fueled by CNG, and a 6.6-liter turbo-diesel V-8 with 525 lb-ft; all offer rear-wheel drive. Body styles feature cargo, “crew cargo,” passenger, and cutaway. The GM vans drive like, well, vans, but they do offer a decent ride; subdued noise, vibration, and harshness; and a variety of excellent powertrain choices compared with the competition. Like the Ford E-series, the GM vans are available in a dizzying array of configurations from baseball-team hauler to delivery van to school bus. GM even offers cutaway (cab only) versions that can be converted to shuttle buses and recreational vehicles. Unlike the Ford vans, the GM vans can be had with all-wheel drive in a regular-duty passenger version. Three different versions from regular duty to heavy duty (regular-duty 1500, mid-level 2500, and heavy-duty 3500) are available in both cargo and passenger versions. Chevrolet offers five gasoline engines in the Express and one diesel engine. The base engine in nonpassenger Express vans is a 4.3-liter V-6 with 190 horsepower and 260 pound-feet of torque. Two versions of a 4.8-liter V-8 are also exclusive to the commercial set—one with 258 horsepower and another with 279 horsepower. Regular-duty (1500 series) passenger-hauling Expresses get a 5.3-liter V-8 (also available on cargo vans) with 301 horsepower and 325 pound-feet of torque. A 6.0-liter V-8 with 323 horsepower and 373 pound-feet of torque is standard in 3500-series heavy-duty passenger vans and optional on cargo versions. Heavy-duty cargo vans can also be equipped with a 6.6-liter turbo-diesel V-8 with 250 horsepower and 460 pound-feet of torque.